This is a fun and super tasty taco spread using seasonal ingredients. As delicious as these veggies are, the fire and flair comes from the salsas and sauces. I think it’s safe to say the seasons have changed, and I don’t know about you but I feel like winter food can get a little boring and heavy. This is a different way to serve them and a really fun spread to invite people over for, plus it’s healthy and nourishing at the same time. You can switch out your filings too as the seasons change or depending what you have in the kitchen. As I said, for me what brings these tacos to life are the salsas, so don’t skip them please! Rather than fresh tomatoes they’re made using dried chiles, nuts and seeds. The chile morita is adapted from Enrique Olvera’s Mexico from the Inside Out; a beautiful and inspiring cookbook. This meal does require a little work but it’s totally worth it and it’s a really nice spread to share with family and friends. It’s also a sneaky way to get people who may not like certain veg like beets for example, into eating them and loving them! Don’t feel like you have to make everything on this menu, I got a bit carried away and I thought it would make a beautiful shot so it turned into a feast. But do make the salsas, I think it’s nice to have the tortillas but also lettuce leaves to wrap. It’s just a little lighter (so you can eat more) and a different vibe to the tortillas. Both delicious! This beautiful taco feast will be part of the main course at our November 11th Yoga Fiesta at Reva studios. Starting at 2pm and finishing 5.30pm with Emmy, the perfect winter afternoon treat. This month we'll be donating £1 of every ticket sold to Our Mala. A charity that 'gives refugees and asylum-seekers a safe space to breathe and stability through Yoga. 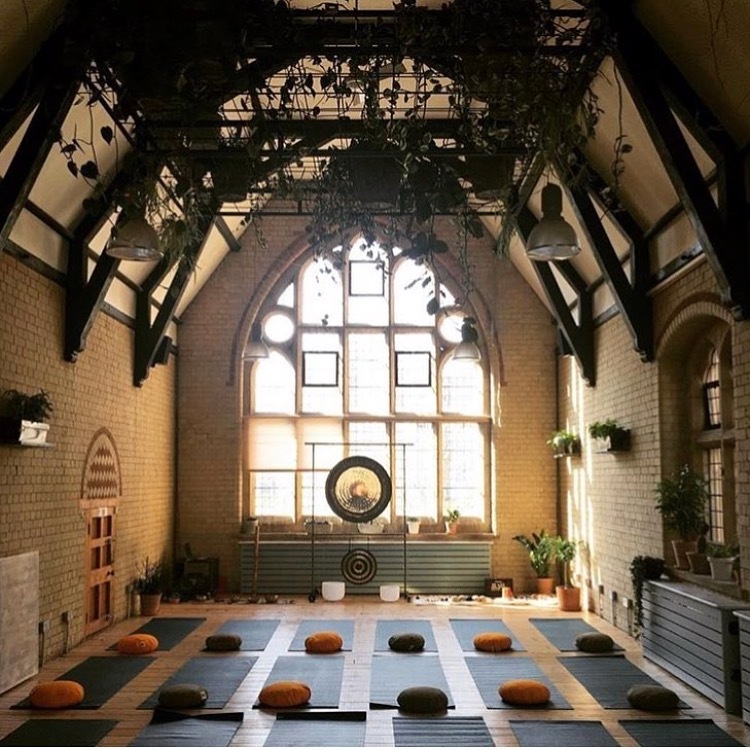 Details and last tickets you can purchase through this link..
An evening event combining yoga, eating, meeting new people, & finishing with a guided meditation. We're very excited to host our first event in in the stunning 42 Acres in Shoreditch. A Sunday Yoga brunch at Reva, to lift you up post holidays. This time the lovely Ness will be joining us to teach. This month we're giving £1 of each ticket sale to Curry for Change , the fundraising campaign that uses people’s love of curry to help change the lives of rural families in Asia and Africa who suffer from hunger. Finely sliced red cabbage for garnish and lime wedges to serve. Do ahead : Trim the cauliflower so it can stand, mix the marinade ingredients in a small bowl and cover the cauliflower in the marinade. Set aside to marinate for an hour. Pre heat the oven 200c. While the oven is warming roast the almonds for the morita salsa, until golden, about 15 minutes. Set aside. Steam the beetroot in a pan with a little water and the lid on for about 30 minutes until just tender. Cut the sweet potato into 2 cm pieces, steam in a little water in a pan with the lid on for 15 minutes. Line two baking trays with parchment paper. Cut the beetroot into 1cm pieces and place on one of the trays, drizzle with coconut oil. On the other place your drained sweet potato and drizzle with the rest of the coconut oil. Roast for 30 minutes until they begin to take on colour, add your onions and continue to roast for another 10 minutes. Place the cauliflower in a small baking tray and roast the for 40-50 minutes until the cauliflower is tender in the middle. Once the your roast veg is ready mix together in a bowl with the paprika, coriander, toasted pumpkin seeds and salt and pepper. To make the almond chile morita salsa. Finely chop or briefly blitz the almonds in a food processor, so they are roughly chopped. In a small pan add your chiles and olive oil, reserving 50ml of the oil. Gently heat until you begin to see bubbles appear in the pan. Turn off and let sit for 15 minutes. In a separate pan, cook your onion in the remaining oil on a low heat until they become soft and begin to caramelise, add the garlic and cook for another couple of minutes. Blitz everything except the almonds in a high speed blender. Transfer to a jar or bowl and stir in the nuts, season with a pinch of salt. For the cashew crema, drain your cashews and blend ingredients in a high speed blender for about a minute until smooth, adding more water if it's too thick. Check for seasoning. Serve with warm tortillas and whole lettuce leaves to wrap. Place all the components in the center of your table and let people to make their own tortillas. Starting with your wrap- tortilla or lettuce, fill with the veg mix, or cauliflower, top with cashew crema & salsa and some finely sliced red cabbage & a wedge of lime. NB. Morita chipotle and cascabel chiles are widely available now in supermarkets. However I use Cool chile for most of my Mexican ingredient needs, you can find their produce in many local shops and Wholefoods. They also have Mexican paprika and great fresh corn tortillas or masa harina – tortilla corn flour if you want to have a go at making your own.